I was invited to see a friend's items that arrived in their recent container and look at what I found! I love this chair! It is a pale robin's egg blue. It is chippy and worn and fabulous. I was very grateful for the call to preview their treasures! I was like a kid in a candy store. I love that the edge of the seat is chipped off. There are layers of green, a darker blue, and red on the back side of it. I made this market tote last weekend. I pieced two different sacks together. I love the shade of the blue. And I think that it is special because of the monogram. It is that of the farmer who used this particular sack. 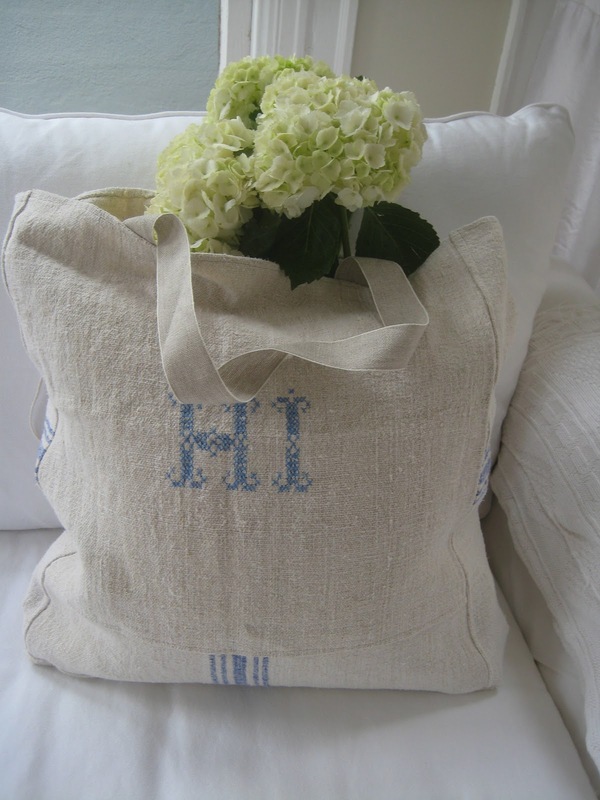 I think that this would be a nice tote to take to the market, or beach bag to carry in Hawaii, or any beach for that matter. The great thing is that it comes with history. This beautiful pitcher came from the same vendor but I purchased it a long time ago. I love the patina on it. There are a few white paint stains on it. It is no longer watertight. I place a glass in it to hold water for flowers. 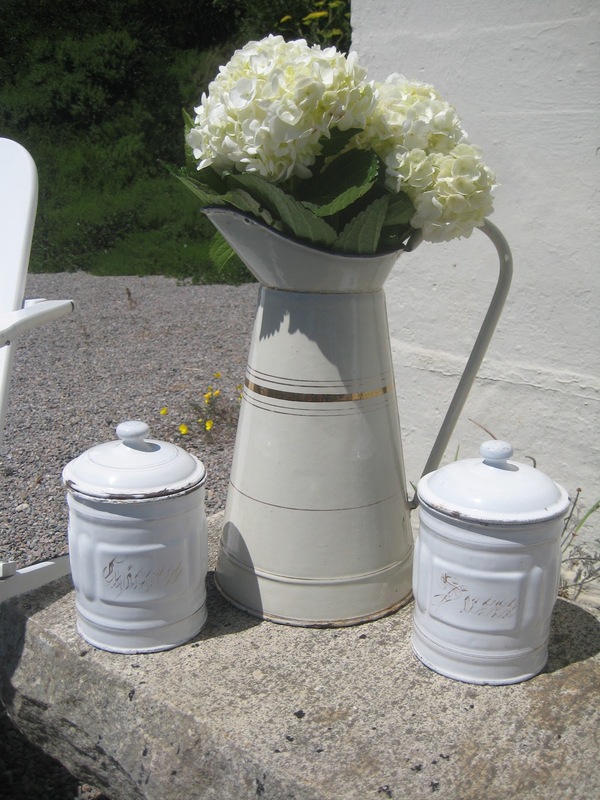 And last but certainly not least, I promised in a past post that I would be getting more enamelware canister sets in. Here are three of the four sets I have found. I am still waiting to receive the other one from France. I like the ribbing on the sides. What a nice touch. The next two pics are sets consisting of two canisters. I really like the faded gilt striping and gothic lettering on both of them. All of the above items, minus the cream and gold enamelware pitcher (cannot seem to list that one yet :)) are available in my Etsy shop. You did it...you grabbed my heart one again. You have the most beautiful things in your shop! Wish I had enough money to buy it all! Love your new finds. 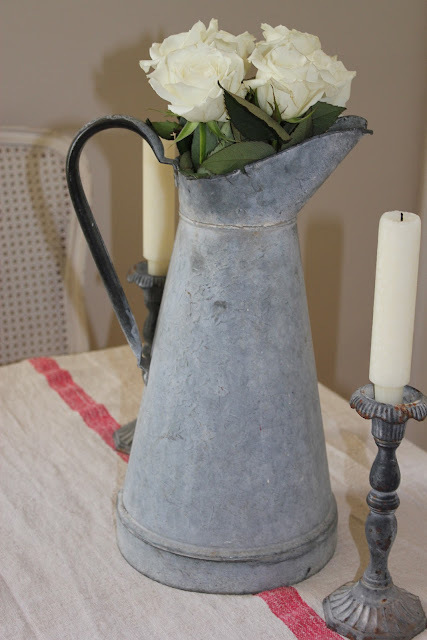 The french canisters, and blue bistro chair are my faves! Lordy, how do you part with this stuff? 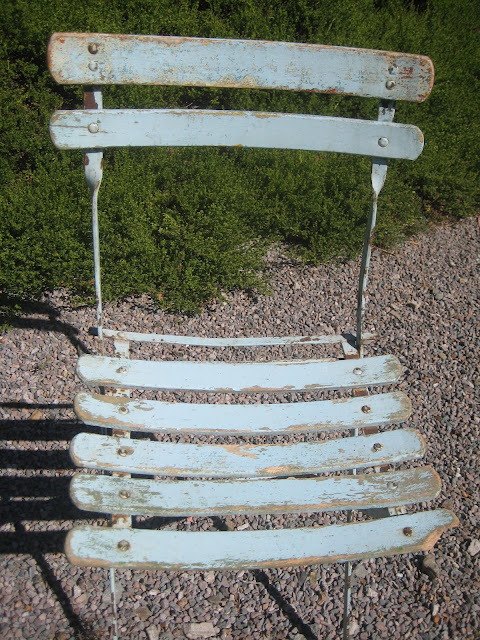 I have wanted a bistro chair in that beautiful blue color forever!!! Now if I only I had the money to spend on it :) It is gorgeous. That bag is amazing too, lucky person who snatched that up. It looks so soft and pretty, I think I'd make it my daily purse just because it's too pretty not to use all the time. Such gorgeous stuff. Love the chair, the canisters and everything else. Simple and beautiful. Lucky lady! Those are some gorgeous things! 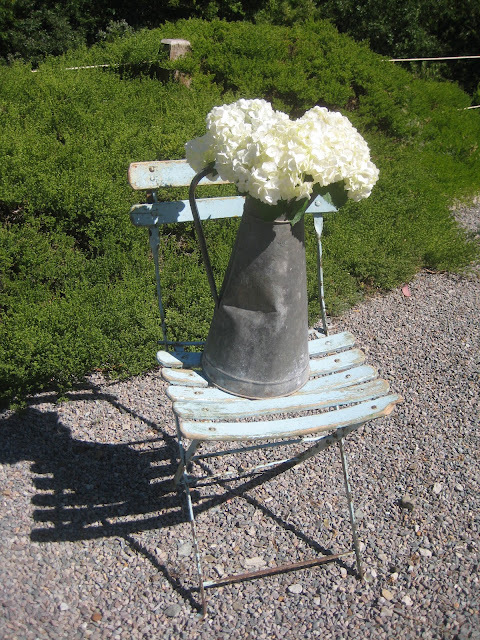 I adore that little chair...the colour is so pretty....great images....great to visit again! Your bistro chair is so cute and all your items are wonderful! let me get this straight. you spell your name with one l, you're blonde, you have a summer soul, and you adore grain sacks and linen? apparently we are meant to be friends! loving your blog (i'm following now!) and shop and am sure to be a new customer! smiles and wishes for a happy weekend. Very beautiful items--thank you for sharing them with us! Great posts! 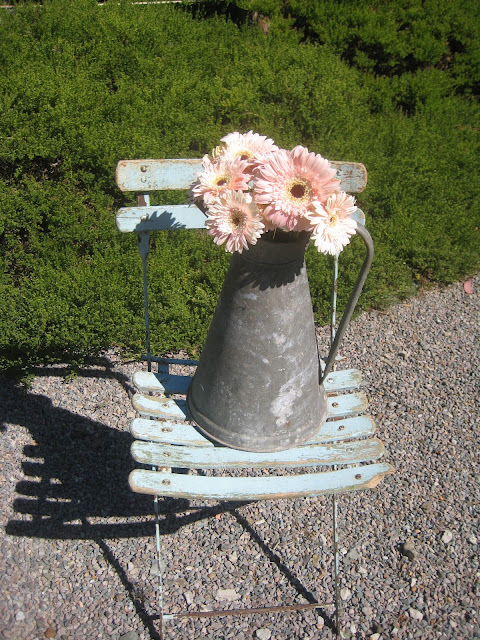 Those stuff that you offer will definitely go well with a set of nice and elegant garden chairs. Awesome! Your bistro chair is just darling. In fact I wish I could buy all your pretties in your etsy shop.